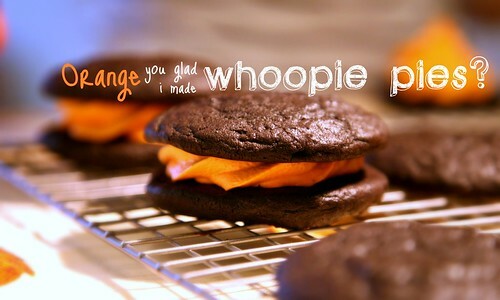 Orange you glad I made Whoopie Pies? 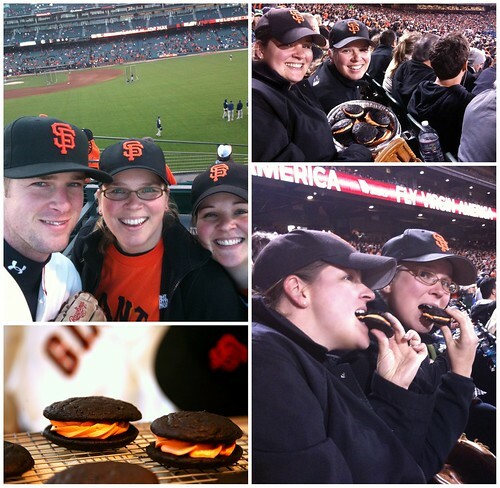 Madie, Mark, Vale, and Cole all went to the Giants-Padres game, which was both Orange Friday and the first game of the series. I babysat Lucy and Oscar, but was still feeling the orange spirit. (It also doesn't hurt that Halloween is just around the corner. Also, my Manhasset and Bucknell days instilled the basic principle that the color orange = fired up!) 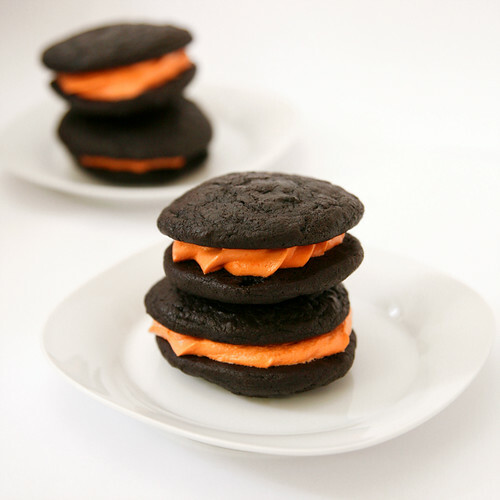 I channeled my spirit into some classically tasty and appropriately festive Whoopie Pies for the gang to bring to the game. Madie and Vale said people were enviously eying the pies when they busted them out. Sift together, flour, cocoa, baking soda, and salt in a bowl and set aside. In the mixer stand bowl, beat butter, shortening, sugar, and molasses in mixer on low until just combined. Increase speed to medium and beat for about three minutes. Add egg, chocolate rice syrup, chocolate and vanilla extracts and beat for two more minutes. Add half of the flour mixture and half of the milk (or milk mixture) and beat on low until incorporated. Repeat with remaining flour and milk and beat until combined. 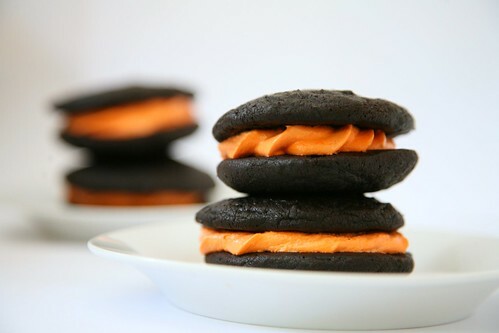 Using an ice cream scoop (1.5-2 tablespoons) drop batter on baking sheet lined with parchment paper two inches apart. Bake for about 10 minutes each or until pies spring back when pressed gently. Keep any remaining batter in fridge while 1st batch is in the oven. Beat the butter and shortening in the bowl of a mixer fitted with the paddle attachment on medium-high speed until smooth, about three minutes. Blend in the confectioners’ sugar until incorporated. Beat in the marshmallow fluff and vanilla until light and fluffy, about two minutes. Pipe filling on flat side of one cooled whoopie. Top it with a second cake and press gently. I recommend eating with a cold glass of milk as soon as possible....although others recommend storing in an air-tight container.